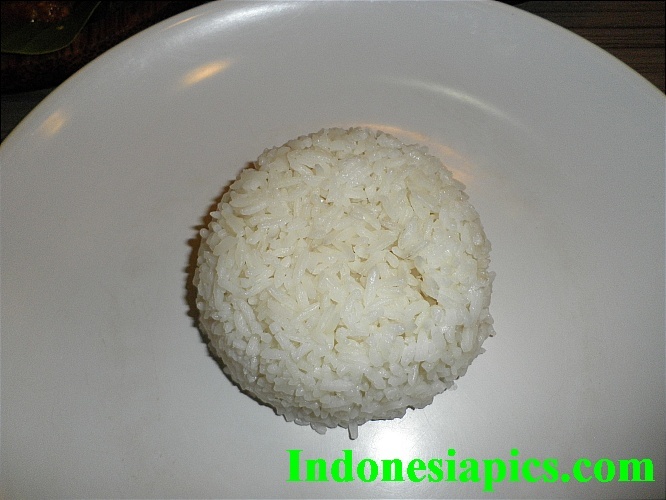 Went to an Indonesian restaurant recently and ordered the rice with mutton, rice with beef and Indonesian salad or Gado Gado. 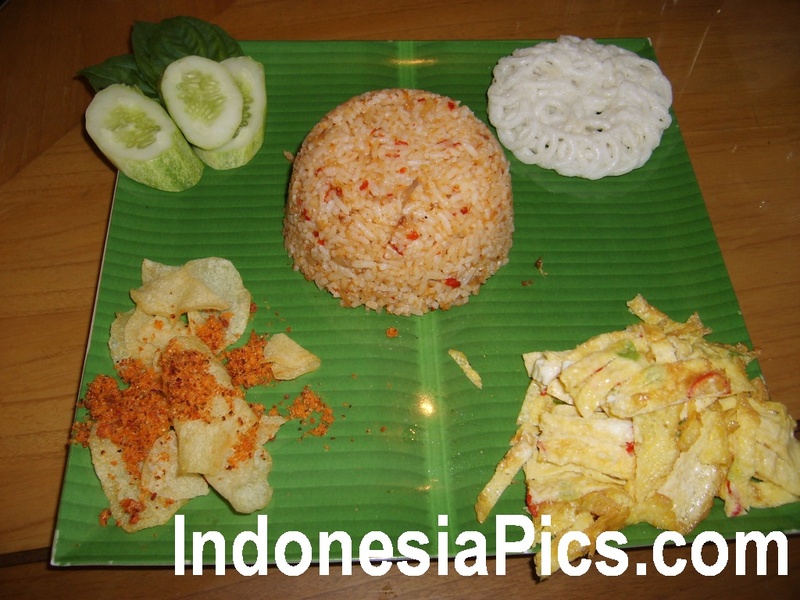 The chilli and the chilli paste that accompany the rice ( nasi ) was very spicy, sweet and at times sour. There are a few varieties of chilli paste to choose. 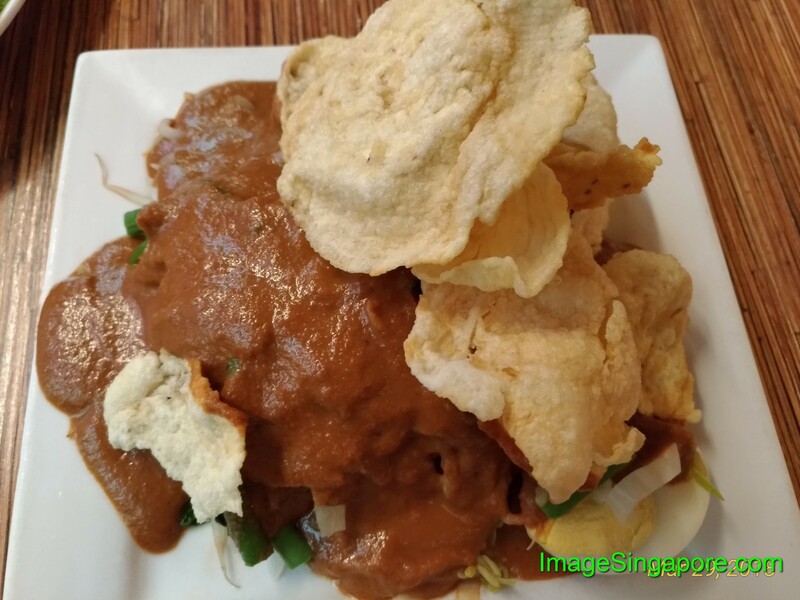 I always enjoyed eating Indonesian food especially the Gado Gado which is basically a salad full of vegetables, eggs and covered with sweet peanut sauce. After eating a bowl of noodles and drink for lunch, I decided to tried out the famous Red Mango Yogurt which my friend is so crazy about. There were a few customers at the shop even during lunch hour as compared to the Es Teler 77 outlet where I had my lunch. The shop signage states that it is USA’s best non fat frozen yogurt, so hopefully it taste good. My first reaction when I saw the prices listed on the menu board was that the food here are really expensive. 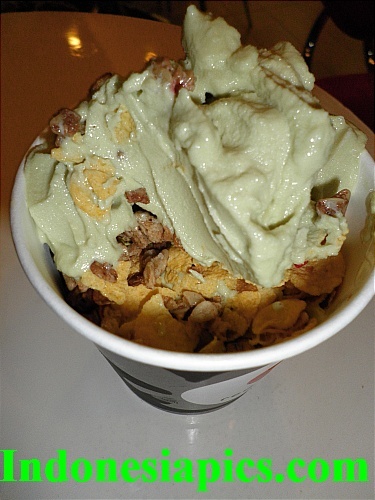 I ordered the green Avocado yogurt with fruit and nuts toppings. The cost of this yogurt ( see photos ) was nearly RP60,000 for a cup of yogurt. The yogurt taste creamy and it is in fact quite solid and firm; unlike some yogurts that melts in your mouth the minute you eat it. I liked the yogurt taste but I felt that it is too little. Perhaps for the price of nearly RP60,000, they should give a bigger portion of yogurt – perhaps 2 scoops served in a better cup. The toppings was nice but nothing fantastic about it. 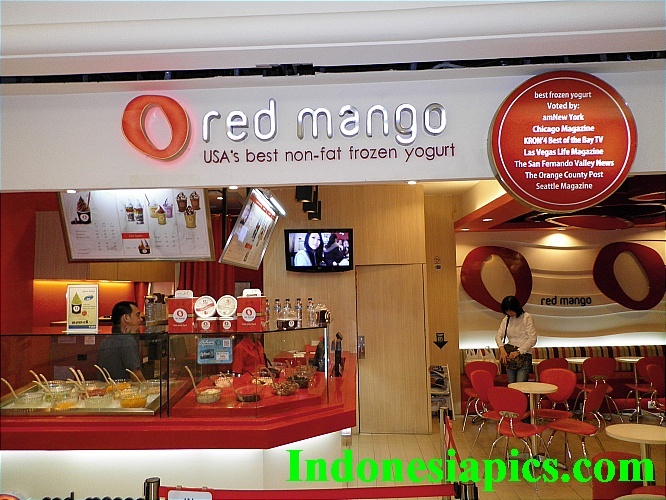 The Red Mango store which I visited was a small outlet with limited seating capacity if you compared it with KFC or MacDonald. But it was sufficient because really there were not many customers even during lunch hour. In fact, there were still many empty seats available. Perhaps that goes to show that not many people would want to pay such a high price for this food. In fact, the noodles and drink that I had in Es Teler 77 was almost the same price as this cup of yogurt. Well if Red Mango can do a promotion on one flavor each month with a lower price for their yogurt, I would definitely com back for more. 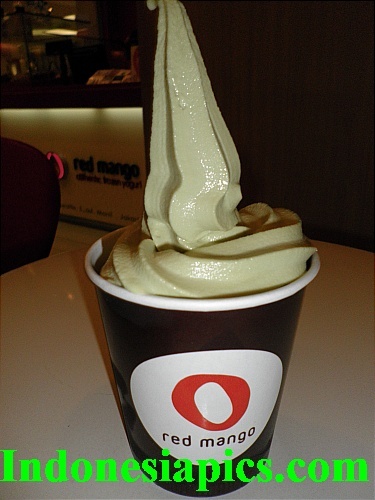 This is the Green Avocado Yogurt with toppings from Red Mango. While I was shopping with my friend at Sun Plaza. 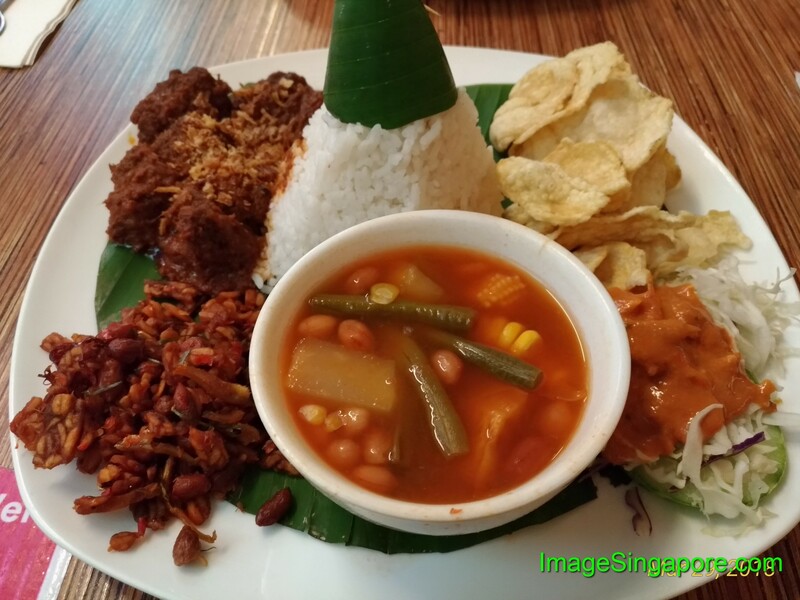 we decided to try out the Ayam Penyet Ria restaurant at LT4 ( which is Level 4 ). There were numerous food outlets in this shopping mall and it would take me days if I wanted to try them all. The Ayam Penyet Ria has a few restaurants located in Singapore and many of my friends are crazy over this food. Personally, I am not so keen on deep fried food, be it chicken, beef or seafood. But my friend had never eaten Ayam Penyet or smashed fried chicken before, so I decided to let her have a go on this food. By the way, Sun Plaza is the most modern and popular shopping mall in Medan. If you are a food lover or enjoy shopping, this is the place to visit while you are in Medan. I will be writing a blog on this shopping mall later on. Ayam Penyet is deep fried smashed chicken. My order for that day was 2 Ayam Penyet – Rp29,000/2 sets, 2 Nasi putih ( white rice ) – Rp13.636/2 sets, 2 Teh Botol ( Indonesia No. 1 Ice Tea ) Rp10,908 for 2 bottles and lastly one bowl of Soto Ayam Ria – Rp 13.636 So the total cost of this meal for 2 persons inclusive of tax was Rp68,999 or US$7.80 which was reasonable. The same meal if you ordered it in Singapore would definitely cost much more. The food arrived at our table in about 10 minutes and the restaurant was not crowded at that time. The staff were courteous and efficient and overall the restaurant was clean and spacious. 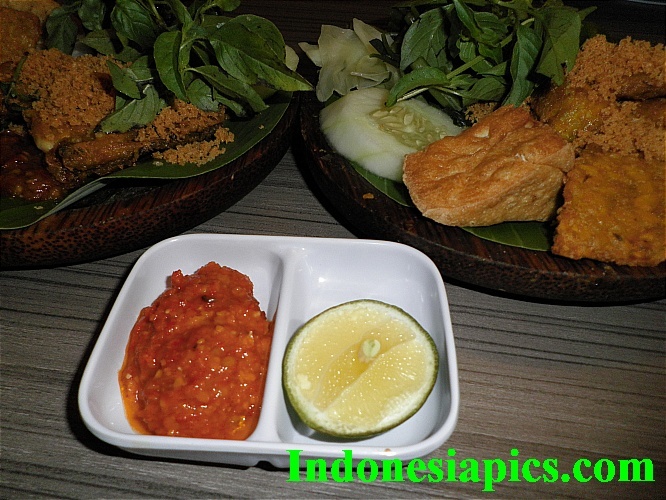 The ayam penyet is delicious and a must try Indonesian food. 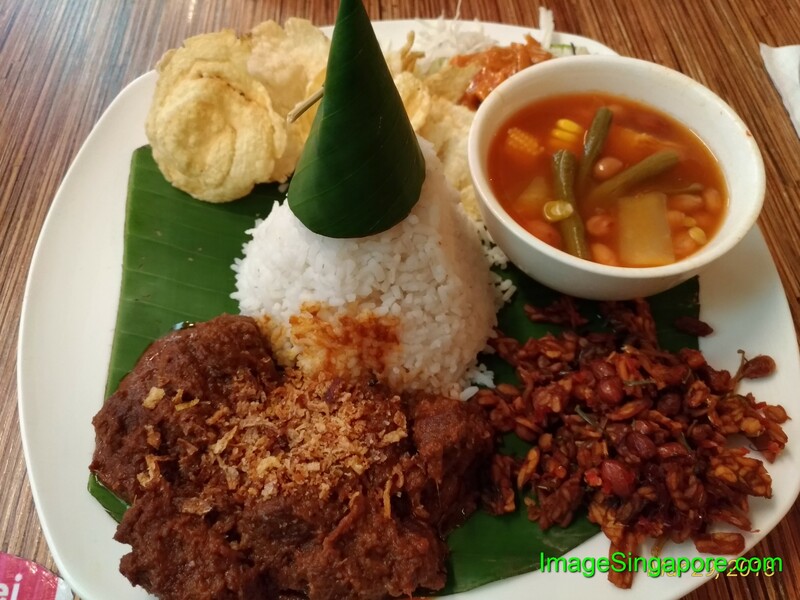 The ayam penyet was placed on a round bowl on top of a banana leaf. Included was a slice of deep fried beancurd ( tahu goreng ) and fermented beancurd ( tempeh ) raw peppermint leaves, a slice of cucumber, small portion of boiled cabbage and not forgetting the blacan chilli. There is also a small serving of a slice of lemon with another type of strong, pungent spicy chilli. The ayam penyet was covered with layers of fried batter bits which actually taste good. The chicken was non oily and slightly dry and it was a small chicken drumstick/ thigh. The chicken serving was rather small as compared to the chicken portion in KFC. Separating the meat from the bones was an easy task and when I dipped the chicken meat onto the blacan chilli, it was a mouth watering sensation – delicious. The other chilli that was served with a slice of lemon was really too strong for me – it had a very strong spicy, tangy and bitter flavor. 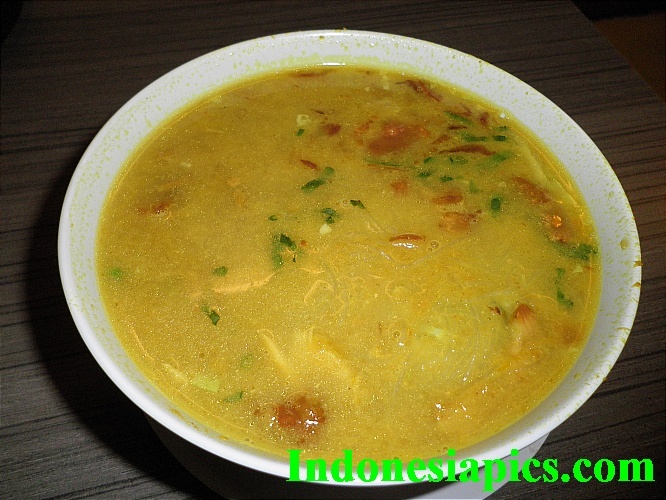 The soto ayam was good – it consists of vermicelli, eggs, vegetables and thin slices of chicken. The gravy of this soto ayam was not too sweet, not oily and not so spicy; and it goes well with the white rice. On my next try to Medan, I will come back Ayam Penyet Ria restaurant again to try their gado gado and oxtail soup as well. As for the ayam penyet – smash fried chicken, it was delicious but the chicken portion was rather small. Well, there are many other food in the menu that I can order if I am still hungry. To be fair, for the price of less than Rp15,000 for a set of ayam penyet, the serving was reasonable. I was told by my friend that I should find time to visit the Ucok Durian store while I am in Medan. It is the most famous durian shop and even the bellhop at the Grand Aston City Hall hotel told me not to miss trying out the durians. So with all the hype about this durian store, I took a cab from my hotel to Jalan K. H. Wahid Hasyim No. 30/32 which is the location of this durian shop. I was told that there are 2 outlets for Ucok durian and this particular outlet opens for 24 hours daily – just liked Seven Eleven convenience store. The journey took less than 20 minutes depending on traffic condition. My first impression of this Ucok durian store is that it was a no frill, simple and messy shop. Durians were piled up all over the frontage of the shop and the workers were busy sorting out the durians. Cheap looking tables and plastic chairs were placed all over the entire shop. On the table is a tissue holder that holds a toilet roll and a metal bowl with clean water to wash your hands. There were also small plastic cups of mineral water on the table for customers. As I sat on the plastic chair, I saw that the road outside the shop had quite a heavy traffic flow; so noise and dust was inevitable. Just order and your durians will be served to you by their staff in the shop. A staff from the Ucok durian store came to my table and asked me how many durians I wanted. I told him 3 durians and the taste of the durian should be sweet and bitter. You can actually request for the type of durian that you want. If you are unsure, just let them pick the durians for you. I saw him telling his staff to pick 3 durians from the large pile of durians that was piling up on the floor. He came with 3 durians in a plastic square container and opened up the fruits. The durians looked good and creamy and he stood there opening up the durians as we ate. If the durian was in bad condition, it would be replaced immediately at no cost. There is no renovation or air conditioned but they served delicious durians. Ucok durian from Medan differ in taste from the Malaysian durians that I had eaten frequently. My friend said that she still preferred the Malaysian durians, as it was stronger in taste as well as smell. My opinion was that durian from Medan had a milder taste and smell. The sweetness and bitterness of the durian was less distinctive than the Malaysian durian. It was still a delicious durian to eat and it has more flesh too. After eating the Ucok durian there wasn’t much lingering smell on my mouth and hand – which was good as I was going for another appointment after this durian feast. 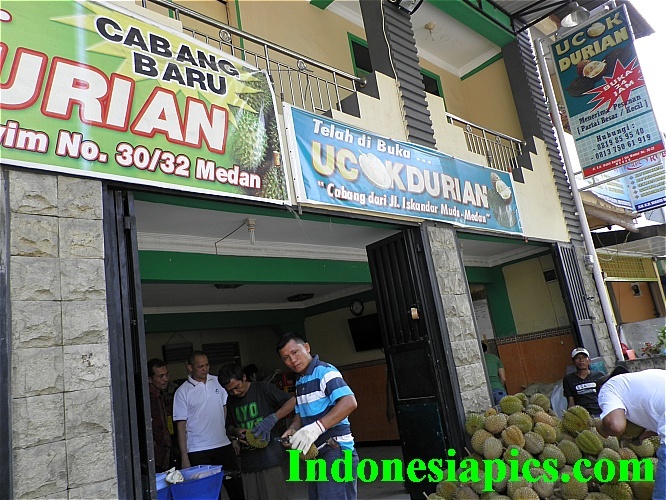 This is a must visit place in Medan if you want to eat Medan’s durians. And talking about the cost of eating Ucok durian as compared to Malaysian durian, the Ucok durian in Medan would beat the Malaysian counterpart hands down. 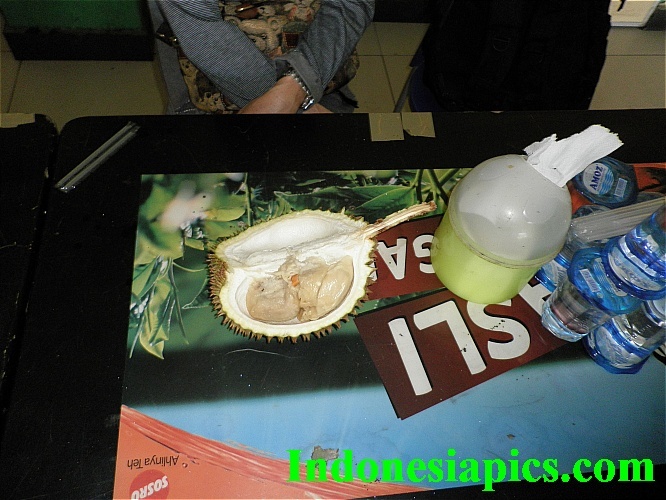 It only cost Rp25,000 for one medium size quality durian. That works out to be US2.80 as compared to US$8 for an average quality Malaysian durian. 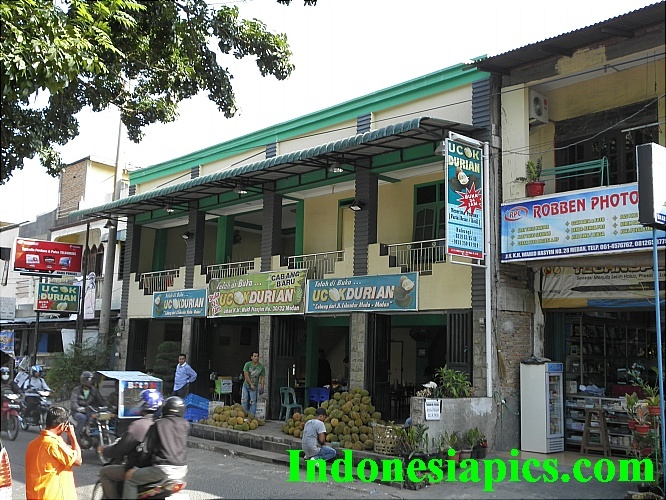 Will I come back to Ucok durian store on my next trip to Medan? Definitely YES! The next time I would probably skip lunch and eat 2 durians instead. The durian shop is crowded in the evenings and on weekends, so if you intend to cut the queue, it would be better to go there in the afternoon. I went to a Chinese restaurant recently and was looking at the menu for some seafood dish in the menu. I saw a dish called Fried Prawns with Macadamia nuts – this is something that I have not tried before and so I decided to order it. When the dish arrived, I saw prawns with the head , legs and shell removed and deveined as well. I think this is good because it is troublesome to remove the head and shell of prawns when eating them. The prawns looked fresh and clean on the plate and I saw some slices of vegetables being added. However I was also eagerly trying to find the Macadamia nuts in this dish. The prawns tasted fresh and the meat was firmed. The Macadamia nuts were roasted and it was crunchy and slightly sweet and salty as well. Overall I liked this dish and would probably tried to cook it in my home. I understand that Macadamia nuts is good for our health. It contain many minerals, proteins, fibre and monosaturated fats; which are good fats which helps to reduce the body bad cholesterol levels. I think the roasted Macadamia nuts taste better as it is more crunchy. However it may be less healthy as perhaps salt and sugar has been added to enhance the taste. The Fried Prawns with Macadamia nuts is a simple and yet delicious dish. It is easy to prepare and cook. All you need are fresh prawns – with shells totally removed and deveined. Then add some vegetables – in the photos you can see carrots, mushrooms and slices of green pepper being added. I think the Macadamia nuts should be added last when the dish is cooked or almost done. 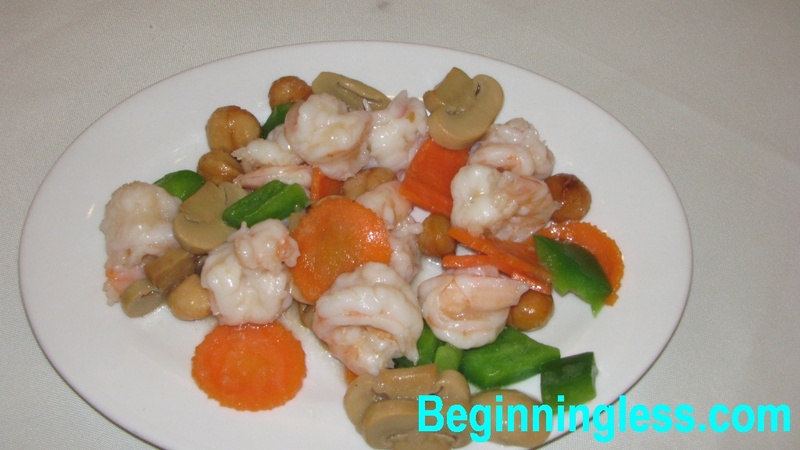 I would want to add the roasted Macadamia nuts last in the cooking process – let it fry for 1 to 2 minutes together with the prawns and vegetables before serving it up. For those who does not liked Macadamia nuts, perhaps you can substitute it with roasted Cashew nuts which I think is also great. I would normally ordered omelette for breakfast whenever I stayed in the hotel. Most of the hotels will offer either the usual butter omelette or mixed vegetables omelette. In Singapore, the fried oyster omelette is a popular food among the locals. I do order this food occasionally and I would instruct the stall owner to make sure that the oyster is well cooked because eating raw or half cooked shellfish like oysters can caused Hepatitis A. There is one omelette which I love to eat but is not found in the menu of many restaurants or food stalls; and that is the Prawn and Mushroom Omelette. 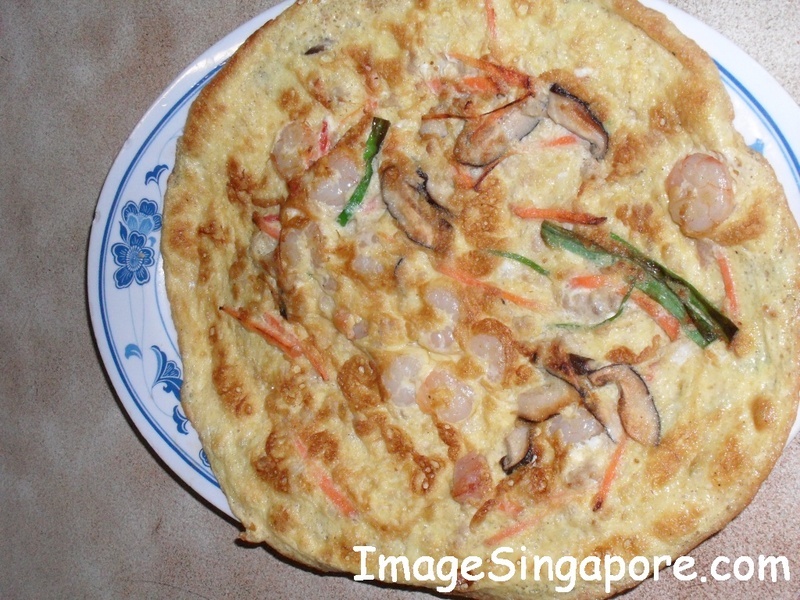 The Prawn and Mushroom Omelette is very easy to prepare and cook and many of my friends said that it is delicious and wholesome meal. In this blog I would liked to share my style of cooking this dish. b) 8 medium sized prawns – peeled, deveined and you can have it whole or sliced in half. c) 4 fresh mushrooms – cut it into small pieces. d) a few slices of ginger, carrots and spring onions. e) sliced chilli or red pepper – this is optional. 1) break the eggs in the bowl and mixed it well with a fork and add some pepper. Some people beat the eggs which is fine. But beating the eggs tends to make it over mixed. I do not add salt because it is healthier or you can add some soya sauce. 2) put some oil on the frying pan and heat it up. Get a medium size pan, because if you cooked it using a small pan, the eggs would become too thick and spongy. 3) put the fresh mushrooms and vegetables into the pan and stir fry it just for a few minutes. Then add the prawns into the pan and stir fry it until the prawns become pink in color. 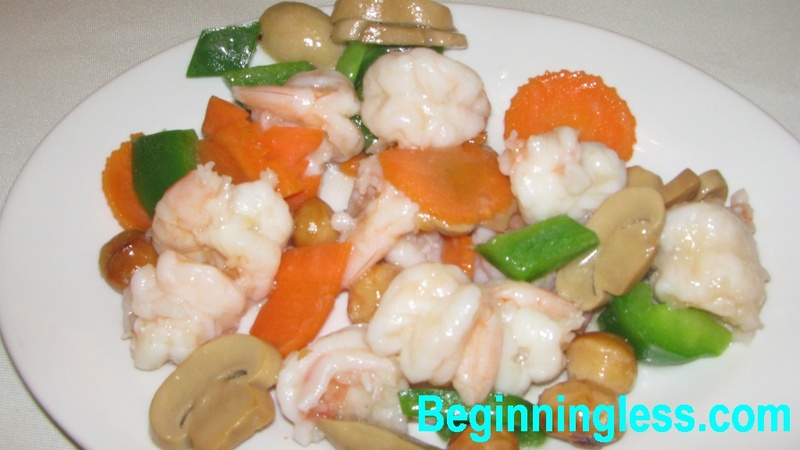 4) when the mushroom and prawns are cooked, quickly pour the eggs into the pan. Make sure that the eggs are spread evenly on the pan. You can do this by tilting the pan till the eggs are spread evenly on the pan. Wait for a few minutes, then flip the eggs over and let it cook for another 2 minutes. The omelette should looked golden in color. 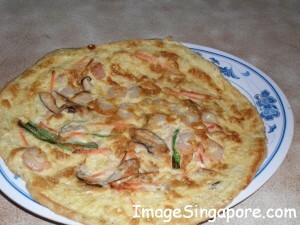 5) put the Prawn and Mushroom Omelette on a plate and it is ready to be served. The Prawn and Mushroom omelette is a easy to cook and is good to eat. In fact there are times when I cooked this omelette as a quick lunch for myself. If you are creative, you can try adding different types of vegetables such as thin slices of lettuce, onions and garlic. One thing to take note is that try to use fresh prawns instead of frozen prawns when cooking this dish, as it will taste much better. Most people in Jakarta loved to hang around in shopping malls and that is the reason why there are so many shopping malls in this city of Jakarta. There will be plenty of food outlets and a main food court in almost every mall. People will have their meals at these food outlets because of the convenience, reasonable prices ( though some food outlets are expensive) and tasty food. But I feel that the food sold in many of these shopping malls taste almost the same and it is very boring. The food that I ate in these shopping malls are either too salty, too sweet or taste flat. Perhaps it is because these food are meant to be cook very quickly to serve the consumers. Normally I will try to find better quality food whenever I am in Indonesia. Quality here does not imply higher prices than those charged in restaurants or food outlets in the hotels or malls. 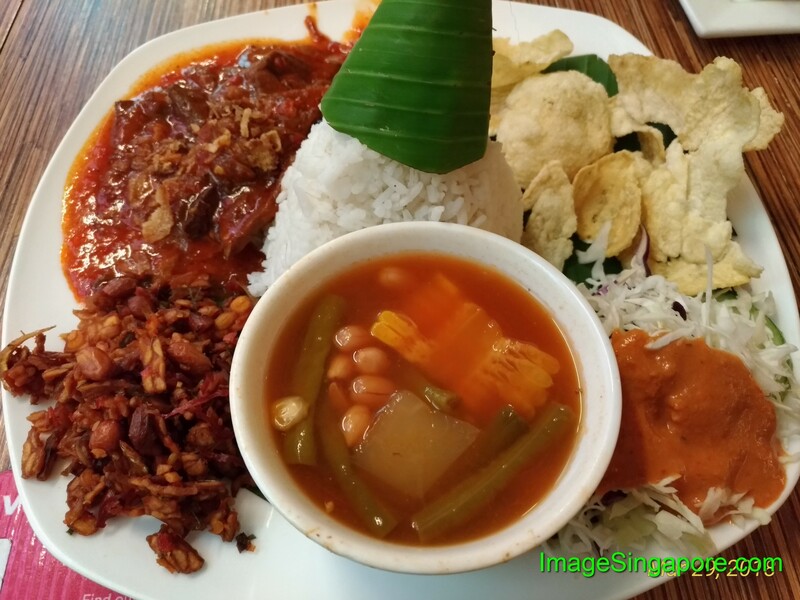 Some of the better quality food in fact cost less than what I pay while eating at the beautiful shopping malls.� So whenever I have the time, I will visit these warungs ( small businesses selling food ) which are small restaurants or food outlets. You can normally find them along the streets. Some of these warungs are located on the busy main streets, while others you need to find them as they are located on minor roads. 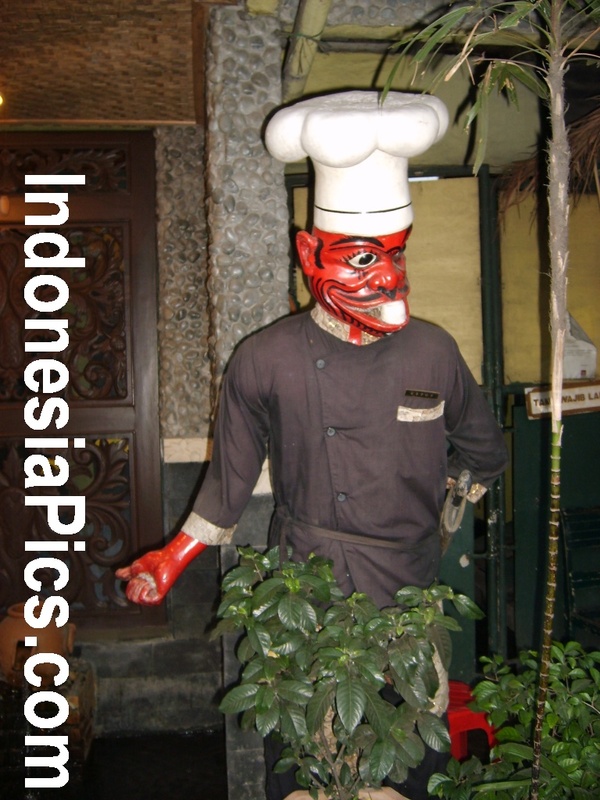 Many of these warungs are simply small family owned businesses and they serve authentic local Indonesian food. To me, these restaurants are the real deal. It is almost like eating food cooked by your mum or grandmother at home. The cost of eating at these warungs are lesser than those restaurants in shopping malls or in hotels. Always ask for their in house specialty dish when you are there. However be prepared to have a less cosy or comfortable environment in some of these warungs. Well if you are there for the delicious food, a table and some chairs will suffice. There is no need for some fancy decoration on the walls or pretty waitresses in smart uniform to serve you. The atmosphere in these warungs are definitely more informal and casual; and I liked it because it is more relaxing. Normally you will also get to see the boss there who will be there either taking your orders, serving or even cooking the food. 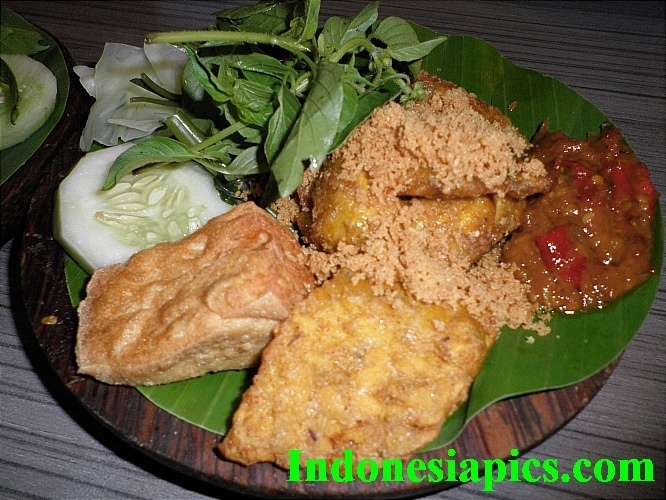 There are many small restaurants in Jakarta serving a variety of food, snacks, deserts and drinks. Some of them served pretty good coffee and tea, in fact better than Star Bucks or Coffee Bean. And I loved the traditional Indonesian cakes and deserts to go along with my tea. So many young people in Jakarta loved to hang around in slick coffee joints in the mall; but for me I prefer the small family coffee shops in Jakarta. In other words, what is important to me is the food – it has to be delicious, good quality and taste like home food. All of us have our own favorite beverages that give us the boost in our daily life. Many people swear by the morning cup of coffee or tea; while there are others who loves their beer, energy drink, wine, milk, etc.� For myself, I love to drink ginseng tea, in particular it is the Korean Red Ginseng Tea. I do drink Chinese tea daily namely Jasmine and Iron Buddha, which I consume about 3 times a day. I normally drink the Korean Red Ginseng tea in the night, about one hour before going to bed. 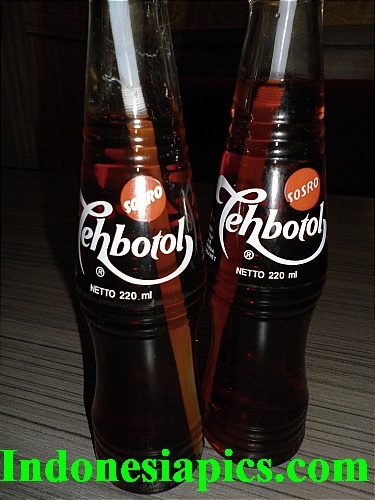 I feel that it has the ability to make me feel relaxed and calm and also the taste is great. Many people knows the benefits of consuming ginseng. Go to any health or pharmacy stores and you will be able to find many ginseng products. Personally, I feel that ginseng has the ability to keep my body fit, more relaxed and also increase the mental and physical energy each day. I have recommended ginseng to my friend who always feel tired and stressed out. He told me that his health has improved tremendously after drinking Korean Red Ginseng tea every day. There is no bad side effects from drinking ginseng tea every day which I have done for so many years. 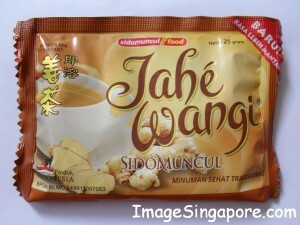 However I keep the consumption of ginseng tea to a maximum of 2 sachet a day and each sachet has a content of 3gm. There are many types of ginseng tea being sold in the stores and what is the best ginseng tea to choose. My recommendation would be to buy Korean Red Ginseng tea. 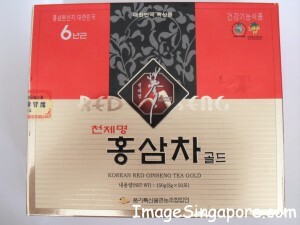 There are Korean Red Ginseng tea that are very expensive which cost more about US$100/- per box of 100 sachets. These are normally premium brands from Korea and if you can afford it – by all means buy them. And at the other far end, there are ginseng tea from Korea that are very cheap, you can get them for less US$20/- for a box of 100 sachets However, these are poor quality ginseng tea and definitely not the Red Ginseng tea. 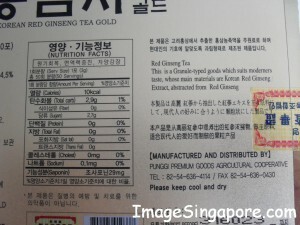 So if you are buying ginseng tea, make sure that it is Korean Red Ginseng tea. This is because Red Ginseng is organically grown in Korea and it has more ginsenosides than ordinary ginseng. The best test is to take an ordinary ginseng tea and Korean Red Ginseng tea and drink it separately for one week.� I did this test myself and the result is this – I threw away the ordinary ginseng tea in the garbage can after one week – it does nothing positive for me and a complete waste of my money. So for anyone who which to see an improvement in their health, buy a box of Korean Red Ginseng tea and try drinking it for a month. You can buy them in smaller box of 50 sachets per box. I am sure that you will be able to see and feel the benefits of drinking red ginseng tea after 2 weeks.� Do keep them in a cool place and if possible you can put them in the fridge. Ginger is a tuber that is essential� in Indonesia for cooking, as a spice and also for its medicinal value. In Indonesia, Ginger is known as Jahe and you can buy it in any supermarket or vegetable sellers in the street. A lot of ginger that are sold in Indonesia are grown locally. There are basically 3 types of ginger in Indonesia. There is the big ginger, the small ginger and lastly the red ginger Red ginger is the hottest and it is� used if you want the food have the hot and spicy taste I used the big ginger often when I cook and it gives punch and� flavor to the dish. If I am boiling chicken soup, besides adding mushrooms and vegetables, I will cut small slices of ginger and add it in as well.� Chicken soup that are boiled with ginger can provide a good relief for common cold and flu; and it is also very easy and soothing on your stomach when taken. When I buy ginger, I will put them in the fridge when I reached home. This help to keep the ginger fresh and enhance the shelf life. I have observed that the fresh big ginger which I bought can stay fresh for about a month when I put it in the fridge. If I want to prepare spices or used it for herbal medicine, then I would buy the small or red ginger. 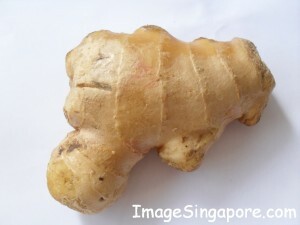 Most of the ginger that are exporter by Indonesia are the big ginger which is commonly used for cooking and beverages. To choose a fresh ginger, I will pick those that are firm in texture and without blemishes. Those ginger that have many blemishes, cracked and limp in texture are probably old and no longer fresh. I do buy ginger tea in the form of sachet from the supermarket and there are plenty of brands you can choose in Indonesia. I prefer my ginger tea to be hot and with less sugar. However when I have the time, I also liked to make my own ginger beverage. It is very simple to do. Buy fresh large ginger and slice it thinly. The more ginger you used, the stronger is the taste; so normally I will buy one or two large ginger for making this beverage. Put the slice ginger in a pot, add water and boil it. I normally boil it for about 15 to 20 minutes and then it is ready to serve. You can add sugar, honey or a slice of lemon if you wish depending on your taste. For my case, I just add a sachet of sugar to my cup of ginger tea. There are so many ginger products that you can buy in Indonesia, such as ginger candy, ginger bread, ginger tea, ginger oil and herbal products, ginger ale, etc.� Ginger enhances your health if you consume it with moderation. I am not aware of any side effects of consuming ginger on the long term basis.� Millions of Indonesians especially the elderly have consumed ginger all their life and remains healthy. 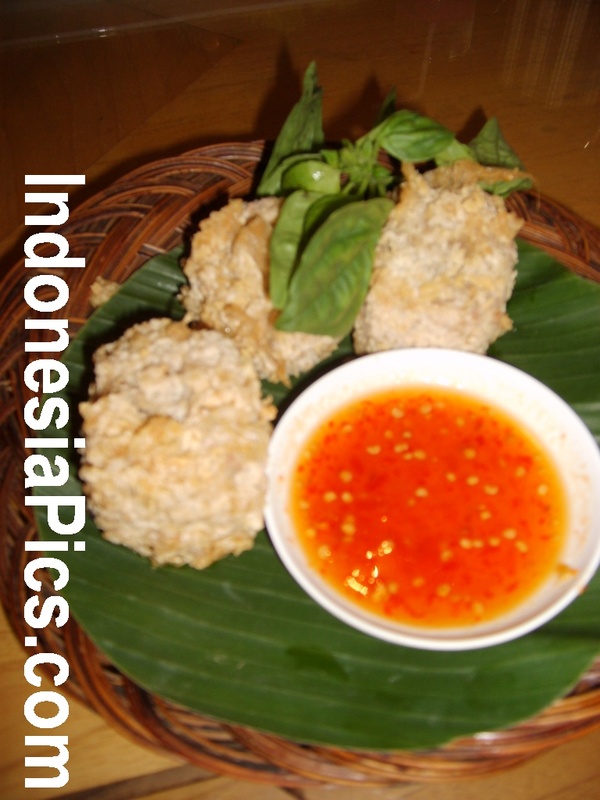 In fact it is rather odd for a Indonesia dish to be cook without the use of ginger. Recently I had a bad flu which is a common ailment nowadays. However with the recent outbreak of H1N1, there seems to be a perception among people that the common flu has become something sinister and dangerous. Many health authorities around the world advised people to take a flu jab in order to prevent yourself from getting this deadly virus. How does a common flu being perceived to be so deadly nowadays? I am not afraid of getting flu or common cold, normally it will be gone in within one week without having to see a doctor. But the main problem that lingers on after the flu is over is the dry cough. For my case, most of the time the cough that accompany the flu will contain phlegm which is greenish yellow in color. When I see a Chinese physician, he will tell me that I have too much heat in my body. And then he recommends certain herbs to boil and drink in order to cool down the body. But there are occasions that after the flu is gone, I may still continue to cough. However this time, there is no phlegm but it is a persistent dry cough. I try taking cough mixture and herbal candy but it does not work. After a couple of days, the dry cough gets worse and it becomes more frequent during the day and night. Dry persistent cough is a nuisance and it affects your ability to function and work. Worse, people around you tend to see you as someone who is sick and irresponsible – coughing and spreading the virus around. I have found a way to cure dry cough using the natural way. It was recommended to me by a lady friend who is a firm believer in Chinese traditional medicine, natural fruits and herbs. She had recommended me to take Almond drink or beverage. So I took her advice and went to a few supermarkets to find natural almond powder. My suggestion is that the almond powder that you buy from the store should contain just pure almond and nothing else. Technically it means 100% almond powder. 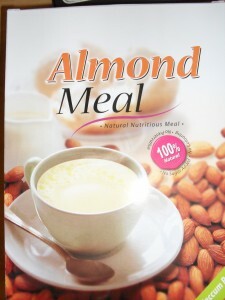 There are some almond beverages that contains sugar, milk, cereal and so on, which is not effective. Take the almond powder and using a teaspoon, put about 3 to 4 teaspoons of almond powder into a cup. Add a sachet of sugar if you wish and then pour boiling hot water into the cup. Stir it well till you see that the almond powder has completely dissolved in the plain water. Then drink it while it is warm. Don’t wait for it to be cool or put it in the fridge. Drink it twice a day – once in the morning and another in the night. After 3 days, I notice that the dry cough has significantly being reduced. Food to avoid during this period are fried, oily and spicy food. Do not drink icy cold drinks or beer. I did continue to drink my warm Chinese tea – which is the Iron Buddha tea. If you have red ginseng tea, that helps as well. After the 4th day, the dry persistent cough that I had was completely gone. I was so happy. This means that I could now do my jogging and cycling or any other activities without coughing. I recommend anyone who has dry persistent cough to drink pure almond beverage. It has done wonders for me and I have recommended this simple natural remedy to my friends as well. Image Singapore Visit our sister site Image Singapore! How Safe is the Hotel Safe?